Land-mines heavily scattered across the Northern regions have hampered the resettlement process, according to Mr Dissanayake. The government appears to implement measures / struggling to avoid a new issue of ‘refugee Vs mines’ clash, that if takes place, could result in a silent but serious human catastrophe in these new settlements. The mines have delayed the resettlement of the nearly 300000 displaced since the end to the war. It is very clear that barring the land mine issue, the resettlement of the remaining 6896 families could be completed in the due course. Nevertheless, the Vanni resettlement issue appears to mask a crisis that looms bigger and one which we are largely pretending to not to be aware about- and it looms across international horizons. 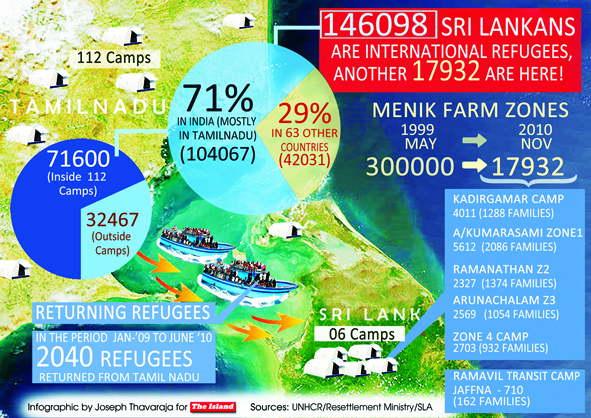 Interestingly, a mere ten days before Major General Ubhaya Madawela’s announcement, Ms. Jennifer Pagonis, the UNHCR Deputy Representative in Sri Lanka, speaking to a national newspaper revealed a shocking fact-a total of 146,098 Sri Lankan refugees are now living in 64 countries, as per the latest UNHCR statistics! This staggering total, most of who are (clearly) Tamils from Sri Lanka, are spread across 64 countries. However, India, France, Canada, Germany, UK, Switzerland, Malaysia, Australia, the United States and Italy are the top 10 countries hosting Sri Lankan refugees, according to UNHCR. 71% of our international refugees live in India, mostly in Tamil Nadu. The worrisome factor is Ms Pagonis’ warning that ‘we have to be cautious of the refugee figures’ – an indication that these numbers could be even higher! According to Ms Pagonis, UNHCR now recommends that asylum-seekers from Sri Lanka are no longer recognized as refugees solely on the basis of the “extended definition” (i.e. due to generalized violence). “Claims should instead be considered on the basis of a well-founded fear of being persecuted on one of the five grounds, political opinion, nationality, religion, race or membership of a particular social group” she adds. The next refugee crisis is therefore looming across international horizons and is even more worrisome. If these ‘international’ refugees decide to return to Sri Lanka-for which there is no real obstacles since as the war is over-the UNHCR’s streamlined method of processing can be adopted to accept them at the arrival gates of the immigration. Unfortunately, this is only a start-not only that we cannot wash our hands off from the arriving refugees saying that ‘UNHCR will take care of it’ but Sri Lanka in unison will have to muster a strong policy platform to address this looming issue as its more than a refugee issue- it’s a crisis in re-integration. Not all international refugees will return-a considerable number will still be better off as ‘refugees’ in the Western hemisphere rather than living in Sri Lanka with the so called ‘privileges’ of ‘full grade Sri Lankan citizenship’! But what of the Lankan refugees in South Asian countries and in less developed countries such as those who are scattered in the African continent? They will invariably return to their homes (one way or the other) as the country’s three decade long war is no more. Also, aggravating the situation is that possibility of refugee glut from the West itself-most of us are now familiar with statements of many a Lankan migrant in the West expressing their desire to return to Sri Lanka since the recession in the West is ‘not really over’ despite the international media stories boasting of new business cycles etc etc. Thus, along with the government departments, NGOs, INGOs, political parties, community groupings and even the media will have to throw their weight behind formulating a set of practical policies of refugee reintegration that cuts across both domestic and international sectors of Sri Lankan refugees (and to implement it!) since National Integration / Reintegration is, clearly, not ‘someone else’s job! What is in the mind of the returning refugee? The question of “What will I do after returning home?” and also the fears of assimilation. Also the issues of documentations, strengthening of basic economic structures such as markets, banking etc and security issues will need to be addressed. The returning refugees are not really heading for a fully furnished ‘home’ ready to welcome them with open arms-rather, upon arrival, they need find the resources and begin rebuilding their hut-often from scratch. Provision of food and non food relief items are essential-no doubt- but what exactly will make the returnee to feel re-integrated? Perhaps the first step in welcoming the returning refugee is to expel any fears they harbor and show activity that will instill hope in them. Any proposed reintegration policies and activism towards the returning refugee could be comprehensive and may involve reams and reams of resettlement maps / charts, graphs, financial budget spreadsheets, time schedules (etc), but all such will be utterly useless if the returnee is apprehensive and does find new hope upon his arrival. Also, often, part of the answer is also found among the returning refugees themselves. A significant number of returnees possess some newly acquired professional and vocational skills and these skills could be put to good use. How can we proceed from here? A starting point could be the establishment of, say, a “Returning Refugee Reintegration Office” (RRRO) –a centralized mechanism which shall coordinate the returnees from the point of their arrival to final resettlement AND being able to be on their own. The proposed RRRO will not be an exclusively ‘government only mechanism’ but could consist of representatives from the government, NGOs and INGOs (Eg: UNHCR, International Org. for Migration, etc), the private sector, livelihood and resettlement experts, and last but not least, some capable volunteers / representatives from the returning refugee sample itself. To this end, return refugee priorities should first be identified by the proposed RRRO, followed by returnee capacity assessments. Such capacity assessments should begin with rapid needs & capacity assessments on reintegration opportunities for returning refugees, followed by a profiling exercise that consists of identification of human resources, skills, training needs and assessment of existing capacity along with the rapid assessment findings, and development of an implementation strategy in line with the priorities identified by the RRRO. The most important feature of the RRRO is that it should not be another ‘pie in the sky’ setup where everyone arrives for the meetings looking to ‘agree to disagree’. It should be an active partner in the overall reintegration scenario and should be made accountable for the progress it makes (or the lack of it!). Bi-weekly progress reviews is a must, with all the stakeholders chipping in. Such an RRRO will also facilitate the private sector to enlist in this national effort since the private sector, though it wants to help, has been taking a back-seat so far as there is no credible authority that the private sector can trust, in this regard. The answer for the looming crisis across international horizon lies in our collective commitment to address it-no less.